It can be difficult to find a good home when you can’t meet the income requirements. And it’s even harder for single mothers, who have to worry about taking care of their children. We want to help make the process of finding low income housing in Michigan for single mothers as painless as possible. 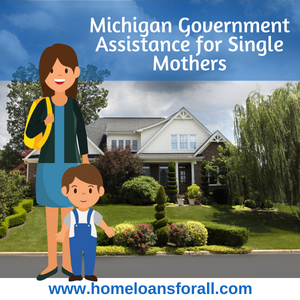 That’s why we’ve compiled this useful list of all of the government assistance Michigan offers to single mothers and all of the loan options you should be considering if you’re looking for low income housing. Mortgage brokers usually don’t look directly at your income, but instead look at the percentage of your income that will be taken up by existing debts and any new debts you take on as part of the home loan. This is known as your “debt to income ratio” and should be lower than 40 percent if you want a conventional mortgage. However, programs offered through Michigan government assistance for single mothers will have much lower income requirements. The state of Michigan offers a great deal of mortgage assistance which you can learn more about here. These include HUD-approved counseling agencies and home buyer/home purchase counseling that can give you advice on the particulars of your situation. If you want to know which programs are best for finding low income housing in Michigan for single mothers, those are good places to start. The state of Michigan also provides certain property tax exemptions to homeowners who are living in a house that they are still paying off. The Michigan Home Heating Credit will help you pay your heating bills if you’re a single mother who has low income. And the homestead property tax allows you to withhold some of your taxes while you’re living in an eligible home that you’re buying or renting. Finally, a number of housing programs are offered to the low income single mothers looking for home loans in Michigan. Those with special needs may be eligible for housing vouchers, and those living in the city of Detroit can take advantage of a special city-specific loan program called The Detroit Neighborhood Initiative. 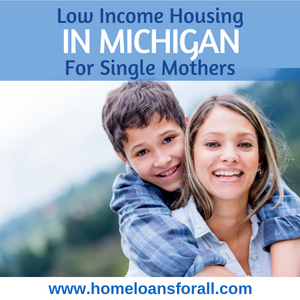 There are also government-insured and government-offered home loans in the state of Michigan that will make it easy to afford low income housing in Michigan for single mothers. 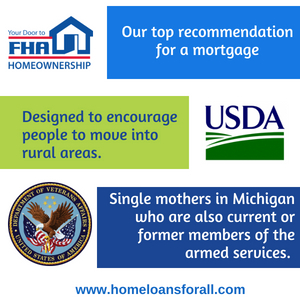 If you’re looking for low income housing in Michigan for single mothers, our top recommendation for a mortgage is the Federal Housing Administration loan, or FHA loan. These loans are insured by the federal government, so they carry less risk for Michigan lenders. As a result, they are willing to give these loans out to individuals whose applications would otherwise be rejected outright. This means that single mothers can find housing in Michigan even if they have low income – and these loans cost much less up front than conventional loans too. If you have a credit score of 580 or higher, you only have to make a 3.5 percent down payment on an FHA loan. If your credit is below 580, you might be able to make up the difference with alternative forms of credit like proof that you regularly pay your utility bills. At the most, your down payment on an FHA loan will be 10 percent of the value of the home, which is still half of the 20 percent down payment required by most mortgages. For this reason, FHA loans are not just great homes for those with low income – they’re also great home loans for single moms with bad credit in Michigan. If you’re a single mom living in a rural area in Michigan, you should consider one of the mortgage loans offered by the United States Department of Agriculture. USDA home loan requirements are usually not as strict as they are for conventional loans because they’re designed to encourage people to move into rural areas. Looking for low income housing in Michigan for single mothers but still want to live in the city? You might be surprised by what the USDA counts as a “rural” area, and as long as you live in the suburbs or outskirts of a larger city like Detroit you may still be eligible. A loans have no minimum credit requirement (although having good credit always helps), no private mortgage insurance, and no down payment. Most lenders will still require a debt-to-income ratio of about 41 percent for a VA loan, but if you shop around you may be able to find a mortgage broker in Michigan who’s willing to accept something lower. These loans are great if you can get them because they save you thousands of dollars in the long run. They make it very easy to find low income housing in Michigan for single mothers. in Michigan for single mothers. Technically, a conventional home loan is an option, but one that you are unlikely to be able to afford. Conventional loans usually require an up-front payment of 20 percent of the home’s total value and the payment of expensive private mortgage insurance (PMI) for most of the mortgage period. Plus, high credit requirements often hovering around the 650-700 range. In short, these loans are exclusive and expensive. However, you might be able to secure a conventional home loans as a Michigan single mom with no income IF you can find someone to co-sign it with you. A co-signer is someone (usually a trusted friend or close relative) who agrees to tie their credit to the property in exchange for better terms on the mortgage. It’s an option that can come with a lot of risk, but if you and your co-signer are confident in your ability to pay off the mortgage it can be a big help. If you can’t buy a home, you can always rent one. That’s one way to find low income housing in Michigan for single mothers. But what if you’re actually looking for a permanent place to live? Well, you can always take out a rent-to-own contract. 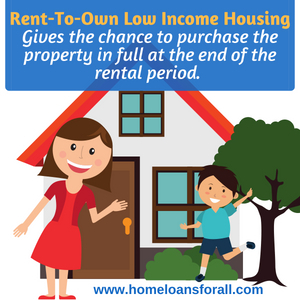 This is a standard rental contract, which means it’s easier for low income buyers to afford than a conventional home loan. However, it also comes with a non-refundable potential options fee which must be paid up front. This compensates the landlord for taking the property off of the market and gives the renter the chance to purchase the property in full at the end of the rental period. Once that happens, you’ll have to seek additional financing using one of the other programs above. But renting to own lets you find housing in the short term while you save up for a bigger down payment in the long term. 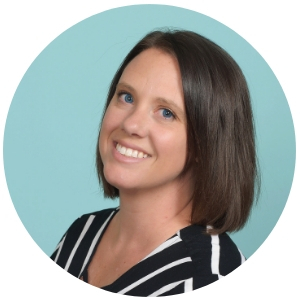 Hopefully you’ve learned a bit about the process of finding home loans and you’re no longer frightened by the prospect of looking for low income housing in Michigan for single mothers. With FHA loans, VA loans, government assistance, and more, we’re sure that the house of your dreams is waiting just around the corner!